Areas of Specialty: Dr. Inder holds board certifications in pediatrics and neonatal-perinatal medicine with expertise in neurology and neonatology. Research and Clinical Activities: As Head of both the Washington University Intellectual and Developmental Disabilities Research Center (WUIDDRC) and the Washington University Neonatal Development Research (WUNDER) team, Dr. Inder conducts studies at the bedsides of newborn infants in the neonatal and pediatric intensive care unit at St. Louis Children’s Hospital. She focuses primarily on premature infants, sick term infants, and infants with cardiac diseases. 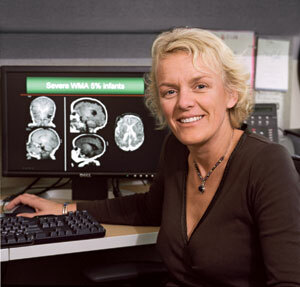 In collaboration with her WUNDER colleagues, Dr. Inder is working to determine the extent to which the brain can adapt to developmental abnormalities caused by premature birth, with the goal of informing and developing clinical strategies that will help normalize brain development. Dr. Inder’s multidisciplinary research requires the expertise of various specialties, much like the research necessary for SmartTots. Dr. Inder is an Editorial Board Member of the Journal of Pediatrics and author of over 100 peer-reviewed publications. Her vast experience is a great asset to the SmartTots Scientific Advisory Board. Verney C, Rees S, Biran V, Thompson M, inder T, Gressens P. Neuronal damage in the preterm baboon: impact of ventilatory support. J Neuropath Exp Neurol 2010;69:473-82. Spittle AJ, Ferretti C, Anderson PJ, Orton J, Eeles A, Bates L, Boyd RN, Inder TE, Doyle LW. Improving the outcome of infants born at <30 weeks’ gestation – a randomized controlled trial of preventative care at home. BMC Pediatrics 2009;9:73. Milgrom J, Newnham C, Anderson PJ, Doyle LW, Gemmill AW, Lee K, Hunt RW, Bear M, Inder T. Early sensitivity training for parents of preterm infants: impact on the developing brain. Pediatr Res 2010;67(3):330-5. Spittle AJ, Doyle LW, Anderson PJ, Inder TE, Lee KJ, Boyd RN, Cheong JL.Reduced cerebellar diameter in very preterm infants with abnormal general movements. Early Hum Dev 2010;86(1):1-5. Newnham CA, Inder TE, Milgrom J. Measuring preterm cumulative stressor within the NICU: the neonatal infant stressor scale. Early Hum Dev 2009;85:549-55. Lawrence R, Mathur A, Nguyen The Tich S, Zempel J, Inder TE. A pilot study of the impact of continuous limited channel aEEG in term infants with encephalopathy. J Pediatr 2009;154:835-41. Beca J, Gunn J, Coleman L, Hope A, Whelan L, Gentles T, Inder TE, Hunt R, Shekerdemian L. Pre-operative brain injury in newborn infants with transposition of the great arteries occurs at rates similar to other complex congenital heart disease and is not related to balloon atrial septostomy. J Am Coll Cardiol 2009;53:1807-11. Beauchamp MH, Thompson DK, Howard K, Doyle LW, Egan GF, Inder TE, Anderson P. Preterm infant hippocampal volumes correlate with later working memory deficits. Brain 2008;131:2986-94. Thompson DK, Warfield SK, Carlin JB, Pavlovic M, Wang HX, Bear M, Kean MJ, Doyle LW, Egan GF, Inder TE. Perinatal risk factors altering regional brain structure in the preterm infant. Brain 2007;130:667-77.